Being a Flag Man, I have been a bit concerned for many months now about the American Flag flying at half mast more and more frequently. I wrote an Enote about the situation asking for comment a year ago and sent it out late last summer. Then I went off on a Walk with my version of the Flag. Now, the wonder about the phenomenon arises again with more concern for the state of the nation. From Tina B: I have been wondering the same thing! It used to be reserved for dignitaries,... now it seems like every other day. and today they are lowered again, and I don't know who died! Last week it was for the theatre killings??? like the president that had just died. From George N: The original symbol was to honor an individual's sacrifice (died in service of their fellow beings). OK to use if for policemen, firemen, and military - service that puts their lives at risk. This week they had a shooting at College Station (where Texas A&M is) and 4 people died. The constable serving the eviction notice, 2 bystanders and the guy getting evicted (the one that shot everyone) and several others were wounded. Who deserves the lowered flag? Those who die needlessly (like those in Aurora or even those that died when Gifford was shot or those who die in natural disasters - weather or earthquakes), don't choose to put themselves at risk. I think their mourning should be private. Should we have a national mourning day for everyone and not just veterans? Catholics have an All Souls Day where they pray for all that have passed. 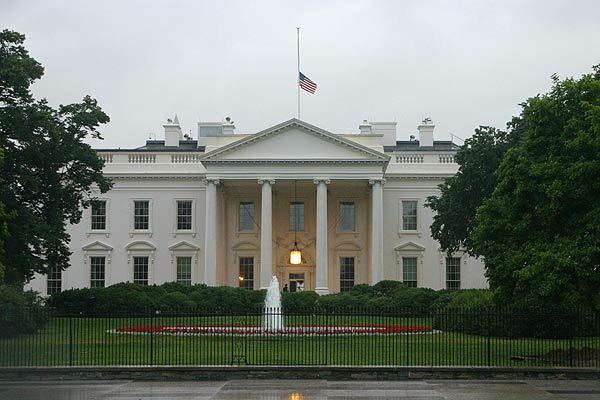 The flag half mast symbolizes grief and loss. From Nicholas O: I have been thinking a lot about the Old USA and current events, and also of the people that live there and that I know. America has a role o play in the world’s evolution. It has the best and the worst. Can help but “marvel” at the love for guns, whether hand pistols to Drones that is so present. The so called Security issues; that is the reasoning behind some people that love “personal” guns so much and the right to use them... to the Government snooping, etc. etc. Some say that guns provide security and preserve their civil rights. Wonder is countries where guns are not so readily available have less civil rights or if this are more threaten? The we have the big businesses; energy (oil, Fracking...) Food Industry and their process products (far away from traditional produce), Genetically Modified everything, another etc. etc. the reality of Gaia, Disaster happens again and the Old Glory is at half mast. We know there are no coincidence but patterns to be understood. America is a complex country, sometimes not easy to understand. I hope that the Fourth Ray energy of harmony thorough conflict enlightens the collective American mind. Commentary: Now more than a year later, it seems half-masting occurs even more frequently. From having the flag lowered nationally at Memorial Day, Patriot Day (quite recent itself), and Pearl Harbor Day, we now have a plethora of reasons to “drop the flag. This short list of recent events causing Half Mast Days came to mind quickly. I know there are more. I have noticed that state governors are getting into the act and lowering state and national flags for various and sundry reasons. (Montana’s governor seems to participate regularly.) Some recent ones follow. llinois Governor Quinn has ordered the United States flag and Illinois State flag lowered to half-staff immediately, Friday, November 1, 2013 until sunset on Saturday, November 2, 2013 in honor of Pontiac Police Department Officer Casey Kohlmeier. Colorado Governor Hickenlooper has ordered flags to be lowered to half-staff statewide on all public buildings on Saturday, November 2, 2013 in honor of astronaut Scott Carpenter. Virginia Governor McDonnell has ordered the flags of the United States of America and the Commonwealth of Virginia lowered to half-staff over the state Capitol building on Saturday, November 2, 2013 in honor of United States Army Staff Sergeant Lyle D. Turnbull. It is encouraged that the flags be flown at half-staff at all buildings and grounds in the City of Norfolk in memory of Staff Sergeant Turnbull. I got these dates from a Half-Staff Website, an interesting addition to the Internet I thought. Whether the Half Masting practice is good, bad or indifferent may be irrelevant. What can be said is that Half Masting of the American Flag is a Sign of the Times. That practice is a prominent and significant symbol - as is our Flag - of the state of the United States of America.